The Joshua Project estimates that there are about 1,600 Suoy in Cambodia. This people group has its own language but most people also understand Khmer. Most are animist in their beliefs, worshipping spirits to whom they offer sacrifices in order to appease them. The Joshua Project puts the number of Christians among the Suoy at 1.5%, or 24 persons. 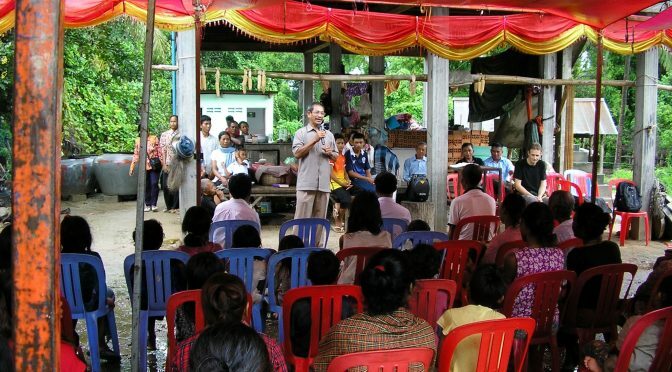 Recently, a CCC team had the privilege of accompanying pastors and a church planter from the Association of Living Hope in Christ Churches on a visit to a Suoy village near Phnom Aoral, Cambodia’s highest mountain. We were joined by our long-time friend Barnabas Mam, one of the pioneers of the Cambodian church, who was to speak to a gathering of Suoy adults and children. Having reached Aoral District, we drove through steady rain along a further 20 miles of muddy, uneven roads to the village. We prayed that the rain would stop so as not to hinder people from attending the meeting and hearing the good news of Jesus. As we arrived, the rain petered out and did not start again until Barnabas had finished speaking. Starting from the existing beliefs of the people, Barnabas delivered a humorous but compelling presentation of the Christian message. At the conclusion of his talk he invited any who wished to put their trust in Jesus Christ and turn to Him from spirit worship to signify their intention. 42 adults and a similar number of children did so. If they were all born again the percentage of Suoy Christians has increased from 1.5% to nearly 7%. The CCC team contributed nothing to this outreach other than our prayers and encouragement. Even after, say, 20 years of language and cultural study we could not have achieved what Barnabas (in the power of the Holy Spirit) did in a single hour. We came away humbled and renewed in our conviction that the people best able to reach Cambodia for Christ are the Cambodian Christians. Khmer can reach Khmer, but they can also cross barriers to other people groups in their country far more effectively than could an expatriate missionary.